Based on our long experience on compressors and air treatment, over the last decade we have also become one of the leading suppliers of nitrogen and oxygen plants in Spain. According to any customers current needs and future expectations, Centralair will design and quote a complete turn key system at very competitive price which will pay for itself based on the great savings that producing your own nitrogen and oxygen represents. 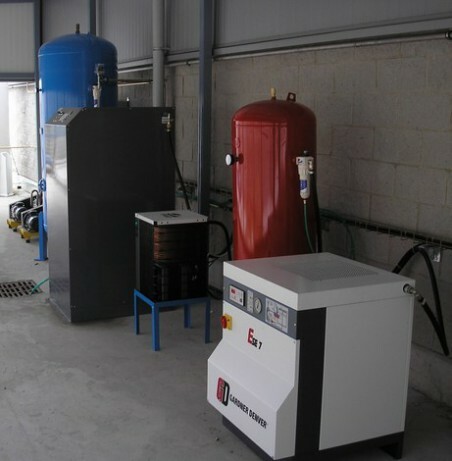 We also cover cases in which storage of the gas at high pressure is required, providing the cylinder banks and high pressure compressors, so our systems are a one stop buy for any customer. If you want to reduce your costs significantly and avoid the inconveniences of buying your nitrogen or oxygen from the big and inflexible gas companies, we invite you to contact us. Many of our customers are already enjoying the advantages of our systems. Why not become one of them. Imagine buying your compressed air? It does not make sense at all, does it? Then, why do you still buy your nitrogen or oxygen if you could produce it yourself as simply as you produce your compressed air?